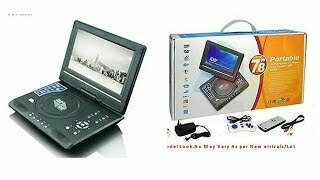 The 3d 9.8 inch portable dvd vcd cd player mp3 mp4 color tv usb memory card slot Player is manufactured by ZVISION and was added around August 2018. This version of the Player comes in Inches : 9.8 Inch. The best price for the ZVision 3D 9.8 Inch Portable in India is ₹ 5000 sold at Amazon and available with free shipping and delivery within 2-14 business day .